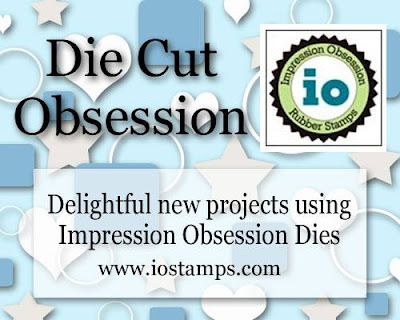 Hi, Today over at the Impression Obsession Blog, we are focusing on die cutting. Head over to the blog for more inspiration. 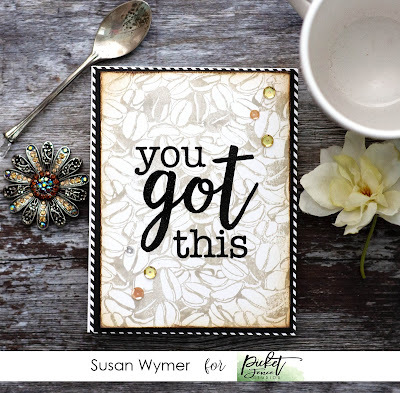 For my card, I used the new die - Funky Floral Frame! Such an easy card to make and I could have made multiples but I was lazy, very lazy! For this card, I created a purple blue watercolor background and splattered it with gouache and Sheer Shimmer Mist. I die cut the panel from three pieces of Neenah Solar White 80 lb card stock. I glued the three of these together with Gina K Connect Glue. Once the panel was dry I attached it to the watercolor base with more Connect Glue. I added a few Pretty Pink Posh clear sequins. Then at the end, I remembered I needed a sentiment and added a white heat embossed Umm...high. I used a small sentiment to keep the focus on my die cut panel. That is it. So easy! Products Used: I am using compensated affiliate links which means I receive a small commission for each sale at no further cost to you. I received the Funky Floral Frame as part of my work for Impression Obsession. As always, I only share what products I believe to be of the highest quality and what are usually on my desk. Thank you for your support. 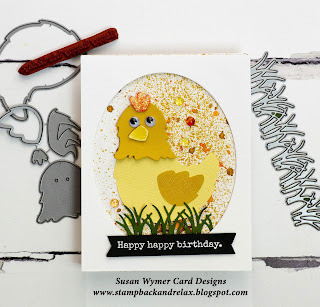 Today I have a card to share that turned out well despite a few - well several - crafty mishaps. I knew I wanted to use the large Botan Peony with either the alcohol ink lift off technique or embossing. Feeling adventurous - that should have been my first clue - I went with the alcohol ink lift off technique on glossy card stock. I used my Copic Various Refills instead of alcohol inks as I had a wider color range to use. They both work the same on glossy card stock or Yupo. I used V04, RV11, RV63, RV66, R56 and RV69. You could use any color combinations. I have video below to show you what I did and also how I fixed my crafty mistakes. Ultimately I had too much alcohol ink in the upper left corner. This left a very sticky area perfect for foiling but not the lift off technique! I should have used more alcohol ink blending solution and I should have left it to dry over night. However, I only had a small window of time in which to make the card, film and edit the video and take pictures. Sounds glamorous - not - lots of fun but lots of work. I am so glad though that I made this card though as I persevered through the worst. I find vellum and heat embossing work to hide a plethora of problems so that final layer is heat embossed vellum! Works every time! Thanks for stopping by. Please leave your questions in the comments box below. Products Used: I am using affiliate links at no further cost to you. I make a small commission on each purchase. I received the stamps from Picket Fence Studios as part of my design team work. As always, I only share what I love and use myself. Thank you for your support. 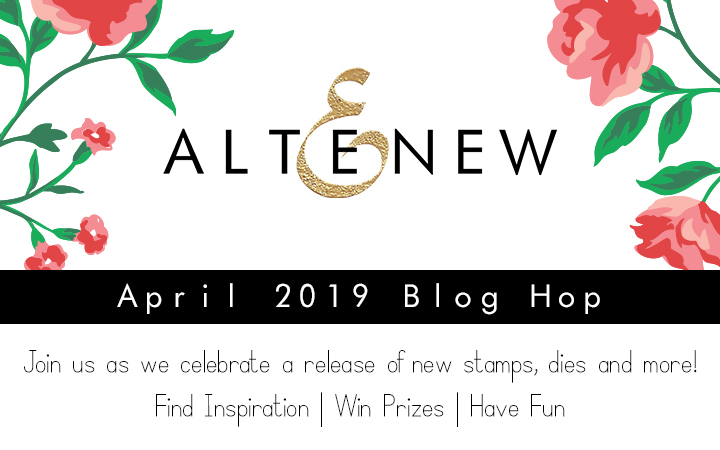 Welcome to my blog and to this wonderful Altenew Blog Hop for the April 2019 Release. You most likely arrived at my blog from Amanda Baldwin blog. The full hop can be found Altenew Card Blog. Altenew will also be drawing a winner to receive a $20 gift certificate from the comments left on my blog and each of the designers' blogs on the blog hop list below. All winners will be announced on the Altenew Card Blog on 5/4/2019. 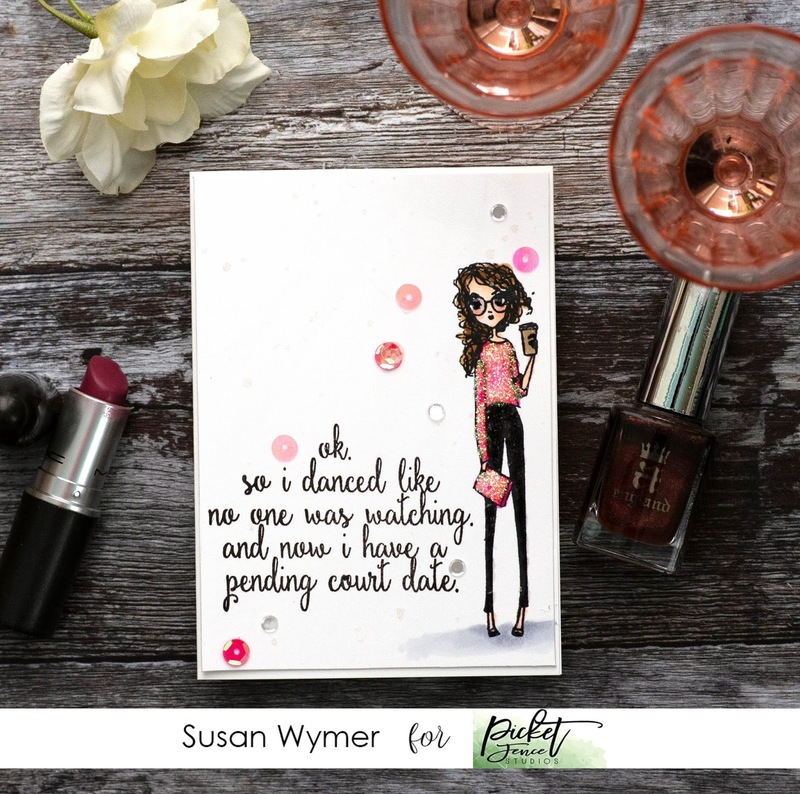 All the new gorgeous April products can be found here. For my card I chose to use the solid image stamp set, A Study in Watercolor. I find solid image stamps to be way out of my comfort zone so I wanted to challenge myself. However, I needed a reliable technique to go with the images. 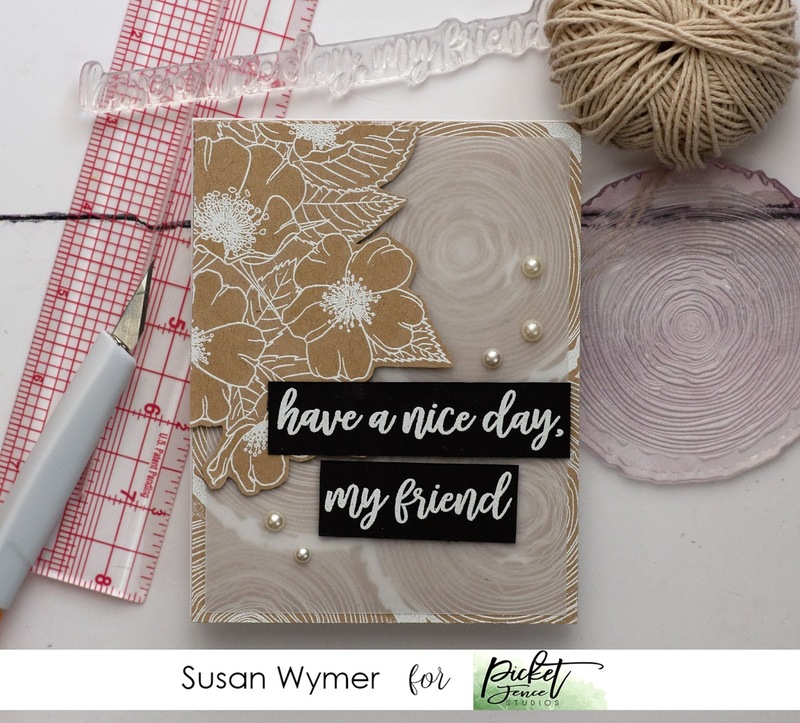 I chose to use emboss resist and use the graduated Distress Oxide blending that Kristina Werner has been showcasing lately. 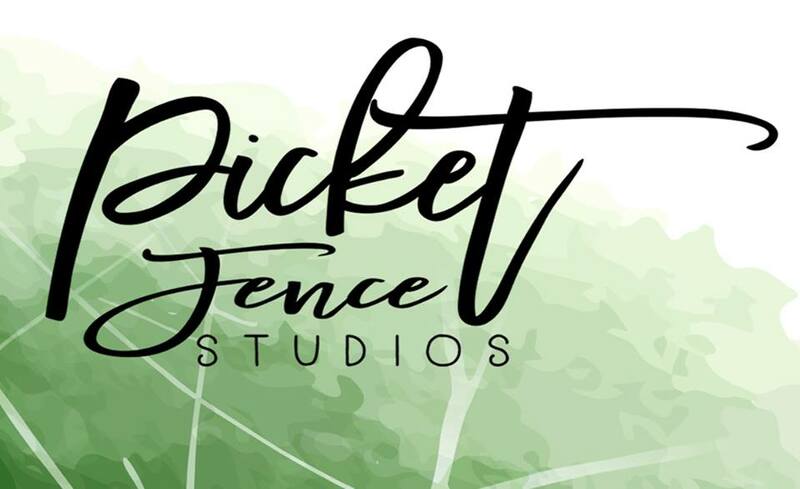 I used Antique Linen, Tattered Rose and Aged Mahogany Distress Oxides with my Picket Fence Studios blender brushes to obtain a smooth, even blend. I have a You Tube video below showing my process in detail. My first step was to emboss the first flower image - oh I was following a layout from the brochure - with white embossing powder. Next I actually used my embossing buddy (this is shocking for me) and then stamped the second image and embossed. I stamped each image separately so I could nestle them together more tightly. After embossing, I used ink blending with my blender brushes and started the lighter color at the bottom and moving to the darkest by the top. After I was done, I wiped the excess ink off the stamped images with a light weight cloth. Next I die cut the smallest hello from Halftone Hello. I used black card stock and layered 3 pieces together to make a thicker sentiment. 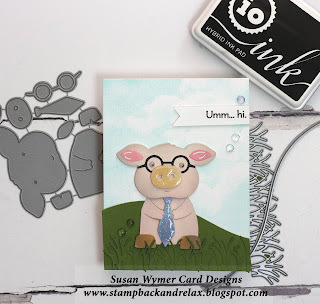 I stamped a sentiment Weekend Doodles to complete the card. Thank you for stopping by. Don't forget to leave a comment to enter for a chance to win the $20 gift certificate here. Next on the hop is Enza Gudor. See below for products used. List for hop is right here! Products Used: I am using compensated affiliate links which means I receive a small commission on each sale at no further cost to you. I appreciate your support. 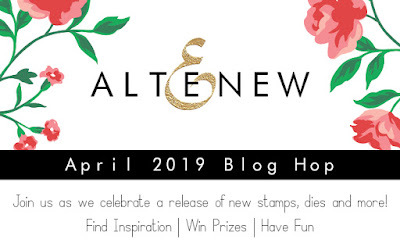 I received the stamps from Altenew as part of my work on this blog hop. I chose which sets to work with. As always, I only use what I love and what is of the highest quality. 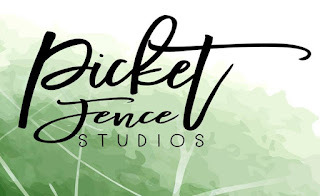 In full disclosure, I am on the Picket Fence Studios and My Sweet Petunia Design Teams - I like good tools! I purchased my own MISTIs and was gifted the blender brushes. Welcome to the cuteness that is the Picket Fence Studios April Release. I had lots of fun with these sets and have watercolor painting for one of the florals. First up is this card. I need the Caribbean and a margarita - especially one made by my friend Joe. This card was so easy to make. 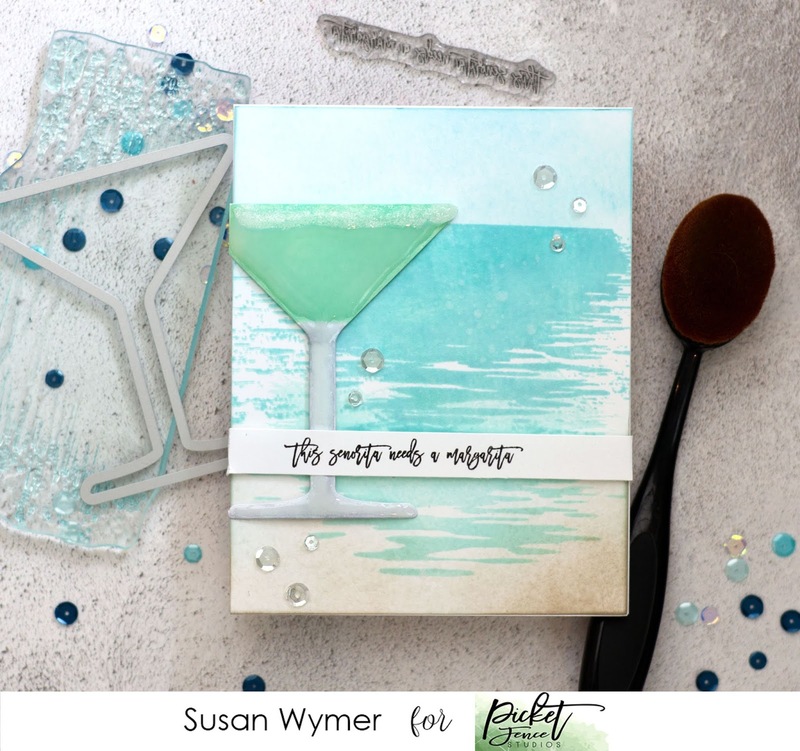 First I stamped the largest layer of Setting on the Ocean with a light blue green layering ink and then I stamped the second layer slightly below that in a darker shade. You need to make sure that to lengthen out your sea as I did here you need to avoid inking the straight edge of the second layer. For the sky I blended in some Tumbled Glass and for the sand I used Hero Arts Cup of Joe. 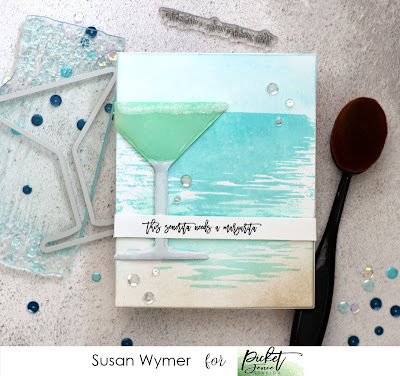 For the drink I die cut some Neenah Solar White 80 lb card stock with the Martini Glass die and stamped the top using the Setting on the Sea die again but with Hero Arts Mint Julep Shadow ink. I colored in the bottom - poorly I might add with grey and blue green Copics. For the finishing touches I added Nuvo Crystal Glaze and some Frosted Lace for the salt or sugar which ever you prefer on the rim...time to drink now. 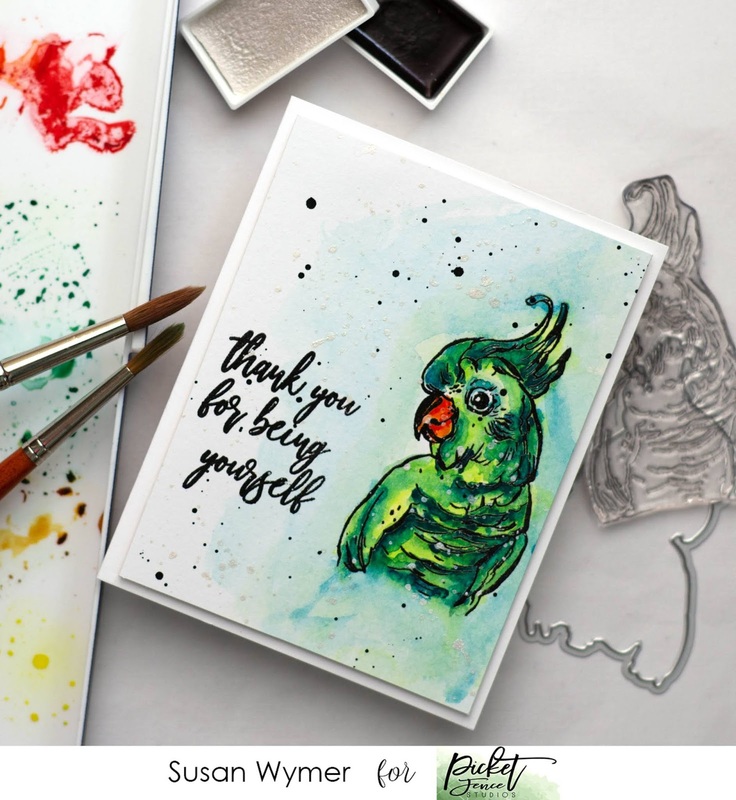 For the second card, I used Pretty Birds and stamped the cutest bird - ok just in my opinion - onto Distress Watercolor paper. I used my Mijello Mission Gold paints to paint in the vibrant greens, yellows and blues. I splatted black watercolor paint and some pearlescent white from the Gansai Tambi collection. I love this new Splash Negative Die. I pulled out an older set - A Dose of Vitamin Sea and color blended this all up. I even used a mask - totally not in my comfort zone. 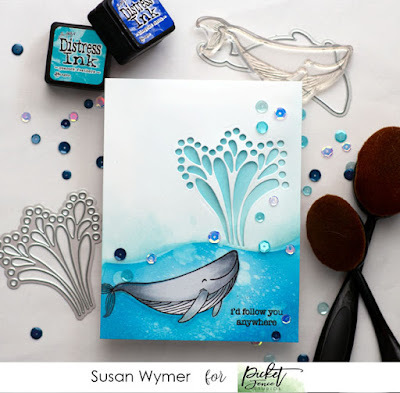 I used Copics for the whale and once the panel was done I used the Negative Splash die to cut out the whale's breathing! Thanks for stopping by. I will be back later in the week with more from this release! So today was going to be another critter day but....... sadly my critters have been held up by the Post Office! 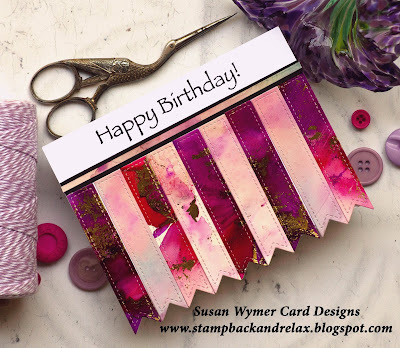 So I made a simple card using the banner die in the Stitched Tag set. So easy to do. I first added alcohol ink to Yupo paper and when it was slightly tacky to the touch I added gold foil. I die cut my banner from this paper. After I die cut the banners, I cut a thin strip of black card stock and a slightly thinner piece of the Yupo paper and added those to the card using liquid adhesive. I stamped the sentiment with Versafine Onyx black. I will be back with a critter card and more floral cards once the post office lets me have my package! 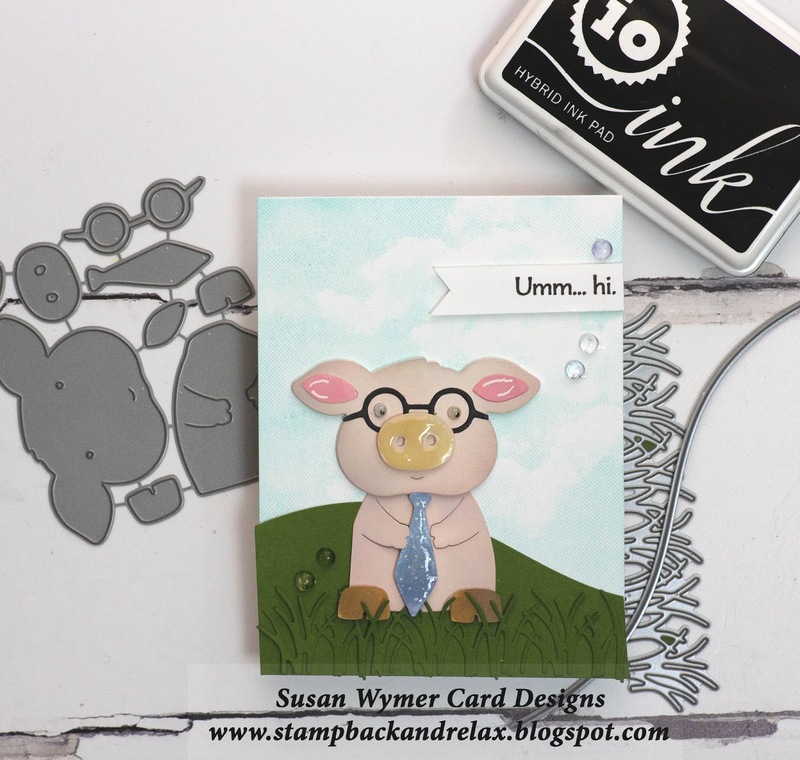 Thanks for stopping by and head over to the blog to follow the rest of the hop! Products Used: I am using compensated affiliate links which means I received a small commission for each sale at no further cost to you! I was given the stamps and dies as part of my work for Impression Obsession. 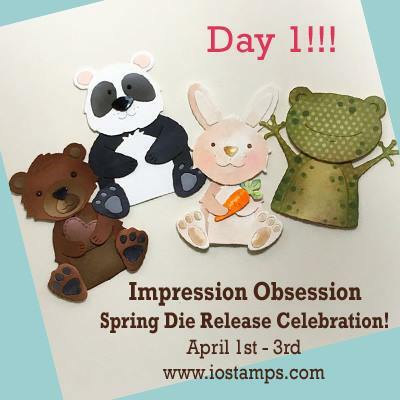 Welcome to Day 2 of the Impression Obsession Spring Die Release. The rest of the hop and some amazing inspiration are over at the Impression Obsession Blog. All winners will be announced on Monday, April 8th. I am really enjoying the products that Impression Obsession sent me. Today, I focused on the Square Frame die set and the Stitched Tag and Stitched Florals. I love combining products and these cards were no exception. This card was so easy!!! I left the Square Frames set attached and cut the set of frames out of Neenah Solar White 80 lb card stock. I,then, reset each frame within a frame. For the Stitched Tag, I also used Neenah Solar White 80 lb card stock and stamped a sentiment from Fred Said using Versafine Onyx black ink. On my second card, I used the same strategy. I die cut a floral paper first and then a soft navy paper second. This color palette was inspired by a recent post of Kelly Lunceford. I alternated my layering by allowing the floral layer to have the square border! I have to admit my little granddaughter gave me hand with gluing down the florals. So I used the Stitched Florals on both cards. For some reason I just needed to get inky. So using my Distress Oxides I made several panels of pink, yellow, green and teal hues using Distress Watercolor paper. Then I ran the Stitched Florals dies through my Gemini Junior. This gave me a lot of florals to work with - hint tomorrow may be more florals! Thank you for stopping by - please leave a comment to enter for a chance to win one of the gift certificates. Head on over to the IO Blog too to follow the rest of the designers! Products Used: I am using compensated affiliate links which means I receive a small commission for each sale at no further cost to you. I received the dies as part of my work for Impression Obsession. 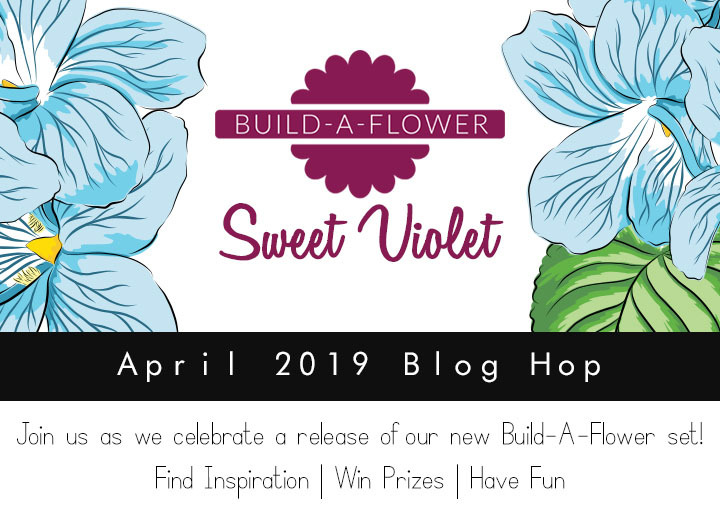 Hi, I am excited to join this Altenew Build a Flower Sweet Violet blog hop for April. The hop starts on the Altenew Card Blog - here. You probably arrived here from Maria Willis beautiful blog. 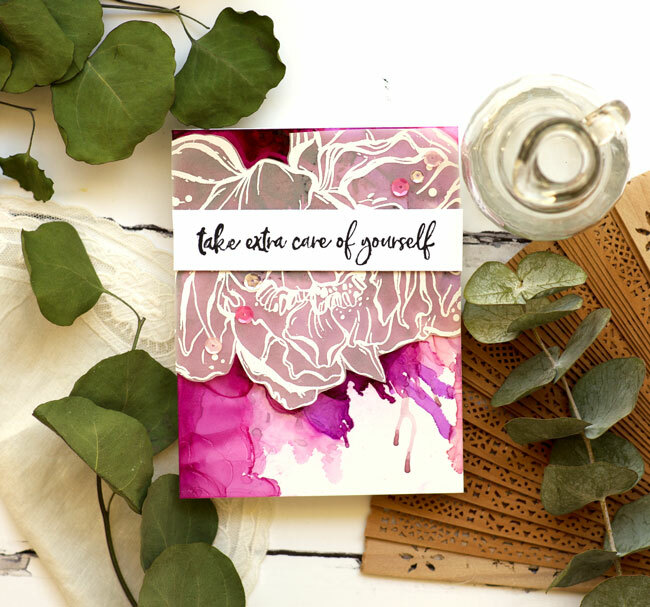 You can find the Sweet Violet Stamp Set here and the Stamp set and accompanying inks here. 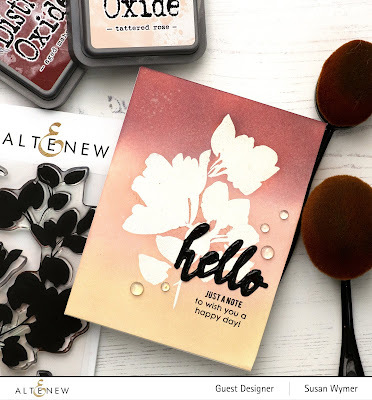 If you are interested the Build A Flower sets are also available in a monthly kit subscription. There is more information on the kit subscription: here. Having the kit subscription guarantees that you will receive the stamp set and other items for that month. So for prizes - yes there are prizes. 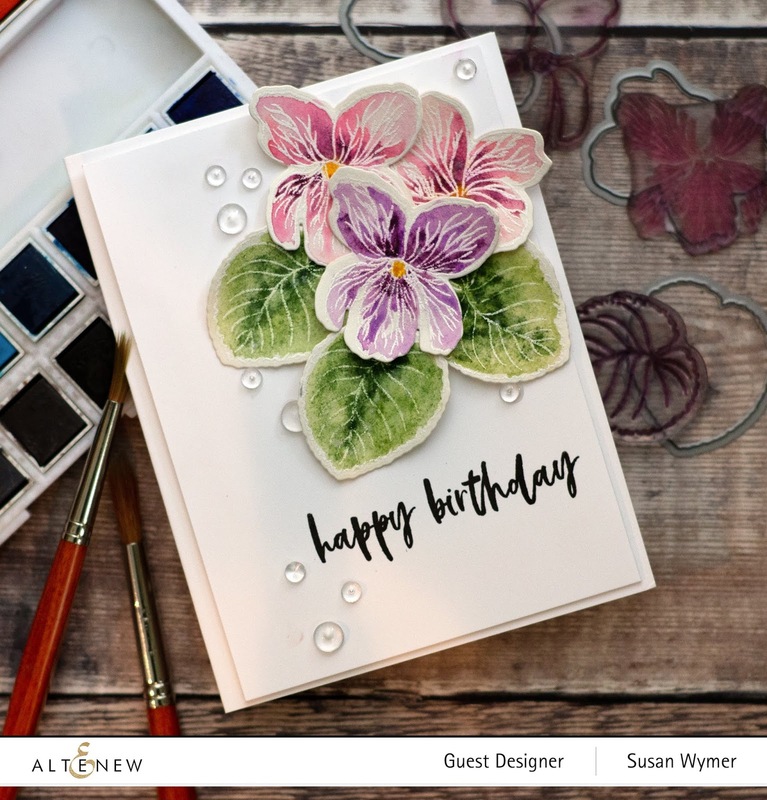 Head to the Altenew Card Blog and Scrapbook Blog to enter a comment toward a chance to win a $30 gift certificate to the Altenew store. There will be 6 winners chosen. Altenew is also drawing a winner from the comments on each blog hop participant's blog! So enter a comment here on my blog for a chance to win a $15 gift certificate. I find layered images challenging. I have had my mom here recuperating from surgical complications and I needed a short cut lol! So I heat embossed the outline layer and the veining (that is what I call it) layer and then used my Altenew watercolors to color the flowers and leaves in. I have a video tutorial below and a pep talk on low or lost mojo and some solutions! First, I heat embossed the two layers using white heat embossing onto Arches 140 lb cold pressed water color paper. Using my Altenew water color paints - I adore these paints. I wish they came in tubes - hint hint lol! I then fussy cut out the flowers and mounted them on the panel. 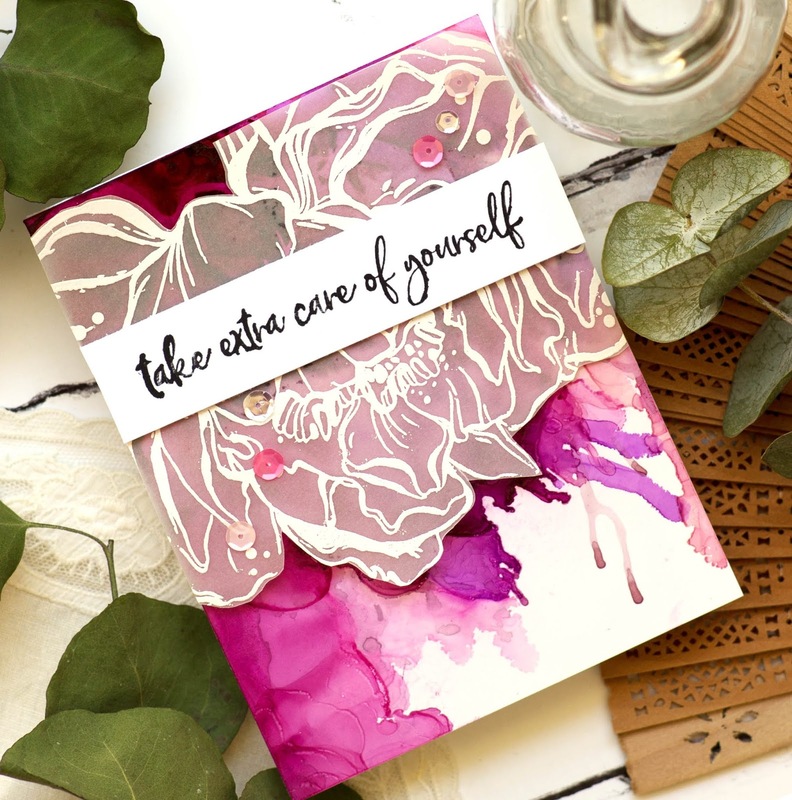 I added a sentiment from Inked Roses and some clear droplets to complete the card. Products Used: I am using compensated affiliate links which means I receive a small commission at no further cost to you. Yay!!! 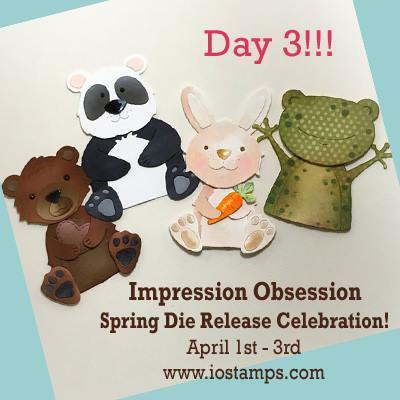 The Impression Obsession Die Release for Spring 2019 is finally here!!! These critter dies were designed by design team member Anna Wight and they are just adorable! They were easy to assemble and can be colored with lots of different mediums. For all of my projects, I die cut everything from Neenah Solar White 90 lb card stock using my Gemini Junior. In the middle of prepping for this release my Big Shot Express, age 16 broke. This resulted in an emergency text to my husband to pick up a Gemini Junior at Hobby Lobby lol! I have weak hands and shoulders so I need an electric machine. I did roll these through my Spellbinders Platinum machine with no problem whatsoever. First up, is the die set Smart Pig. He is very shy and forgot to bring flowers to his date but he did remember to wear a tie. To color him, I used my Picket Fence Studios Blender Brushes and Tattered Rose and Warm Lipstick Distress Oxides. I gave him a pair of giggly eyes from my vast collection - they are years old - so ridiculous! I die cut the lawn and the hill from some green card stock. For my next card, I used the Chicken set which includes a hen and a chick but I just wanted to focus on the hen - mom's need attention too! LOL!!! I die cut her out of two sheets of very old paper and popped her up on a background sprayed with a few shades of Tattered Angels Ink Sprays. 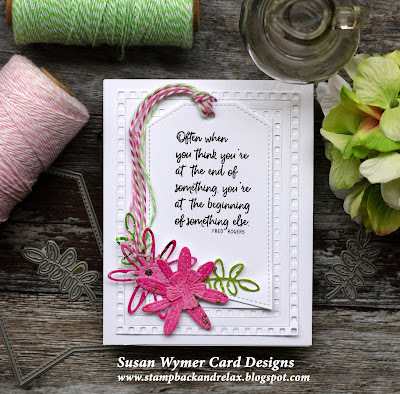 I added our grass border and a sentiment to finish this card up. I also added our lawn die in green paper. I know that coxcomb (the red thing) is supposed to be behind her head but I wanted it to look like a crown. I popped it on the front and added some R37 Copic Sketch marker and Crystal Stickles. Products Used: I am using compensated affiliate links at no further cost to you. I received the dies and stamps for my work with Impression Obsession. 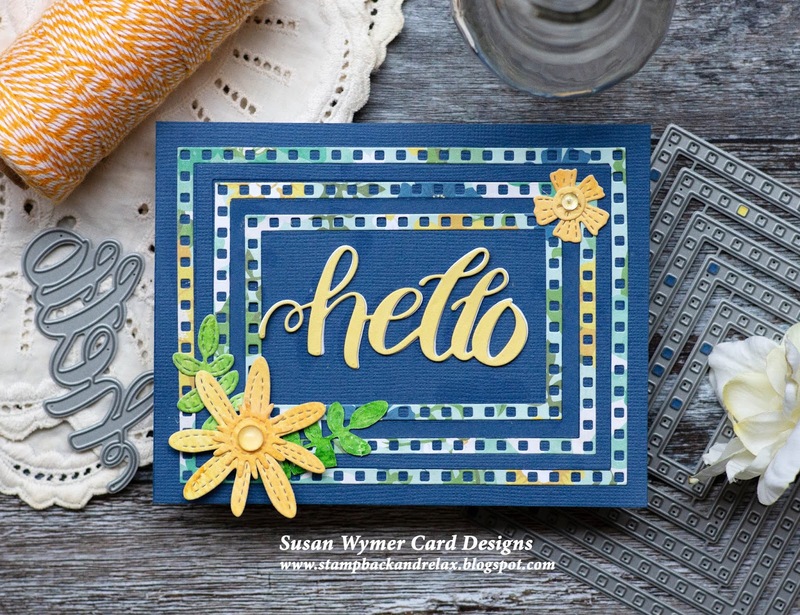 Hi, I am up over on the Picket Fence Studios blog today. I needed a quick and easy card as I had a lot of house guests coming and going. I had no creative mojo so I cased one of my own designs. Hey it is necessary sometimes. Anyway, I love wood slices and this is my third one. I also love rustic decor not that my house is decorated that way but I am fascinated by this type of decor. My theory on home decorating is that if I follow every trend I will be constantly redecorating. So instead, I decorate my cards! 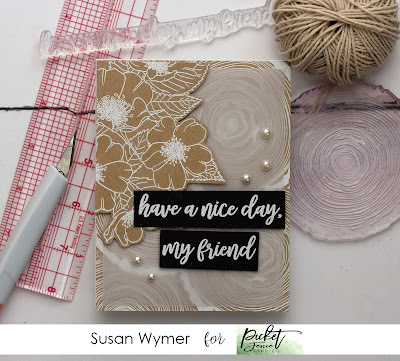 First, I repeatedly stamped and heat embossed the Slice of Wood stamp with white embossing powder on Neenah Desert Storm. Heat embossing is one of my favorite techniques. It is easy and packs a wow factor. Plus I just like watching the powder melt ha! Next I heat embossed the Wild Rose Bouquet in white on another sheet of Neenah Desert Storm and fussy cut a partial bouquet. I placed a piece of heavy weight vellum ( 4x5.25") over the wood slice background to tone it down a bit. Using vellum to tone a background down is an easy thing to do and another of my favorite techniques. To finish, I mounted the partial bouquet with some 3M foam tape onto the vellum panel. I added the sentiment by heat embossing it in white and then cutting it into 2 strips. This sentiment was really meant for a landscape oriented card so that is why I split. Here is another view of the card! I am using compensated affiliate links which means I receive a small commission on every sale at no further cost to you. Thank you! Brenda Fiest you were selected from the comments on my blog as the winner of the gift certificate I had. Please use the contact me button on the top right so I can send you the gift code! 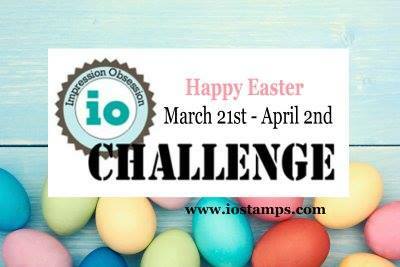 Hi, Welcome to another Thursday challenge over at the Impression Obsession Blog - we have lots of great ideas from the other card designers and the details on how to enter the contest to win a gift certificate to the IO Store. 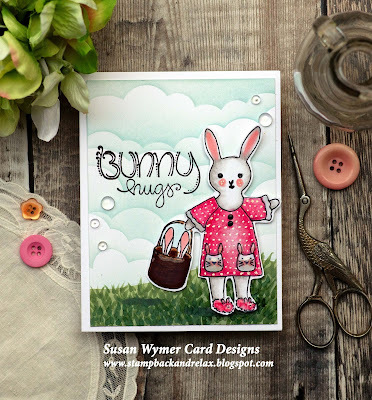 So for my card, I had to pull out this cute bunny set, Bunny Girl by Alesa Baker, who is one of my favorite Impression Obsession designers. To start I ink blended some Bundled Sage Distress Oxide onto an A2 card base and then I added flicks of different colors of green Copic markers to make a more textured grassy background. 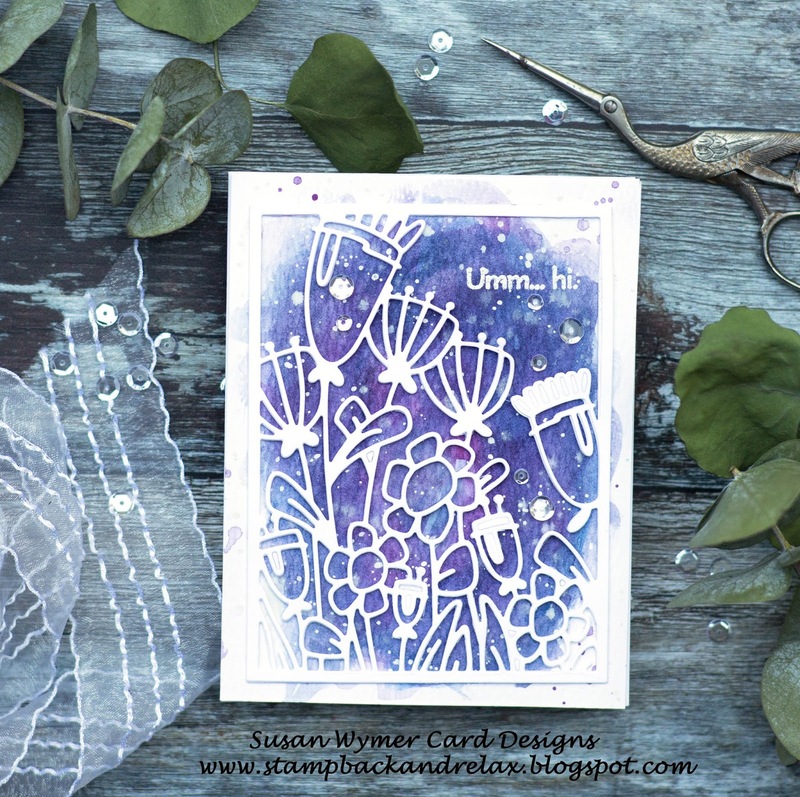 For the clouds I used a cloud stencil with Tumbled Glass Distress Oxide and my blender brushes. I did not flick any water or Sheer Shimmer onto this part of the background. I usually do. I stamped the bunny and her dress and accessories in Impression Obsession Black Hybrid Ink which is Copic friendly. I did a small amount of masking to put the image together. I colored her in with Copics and then fussy cut her out. I added some foam tape to pop her up off the panel. I added some Nuvo Crystal Glaze to her pockets and the basket. I had to put in a few Pretty Pink Posh clear droplets - my mother said no but I ignored her lol! Oh and I added some white gel pen detail to her dress. Product List: I am using compensated affiliate links at no further cost to you. I purchased the stamps and products used in this projects. I was under no obligation to use them. I have used Impression Obsession products for many years. 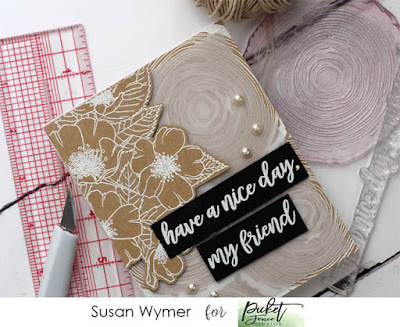 It is Monday and Die Cut Obsession Day over at the Impression Obsession Blog. 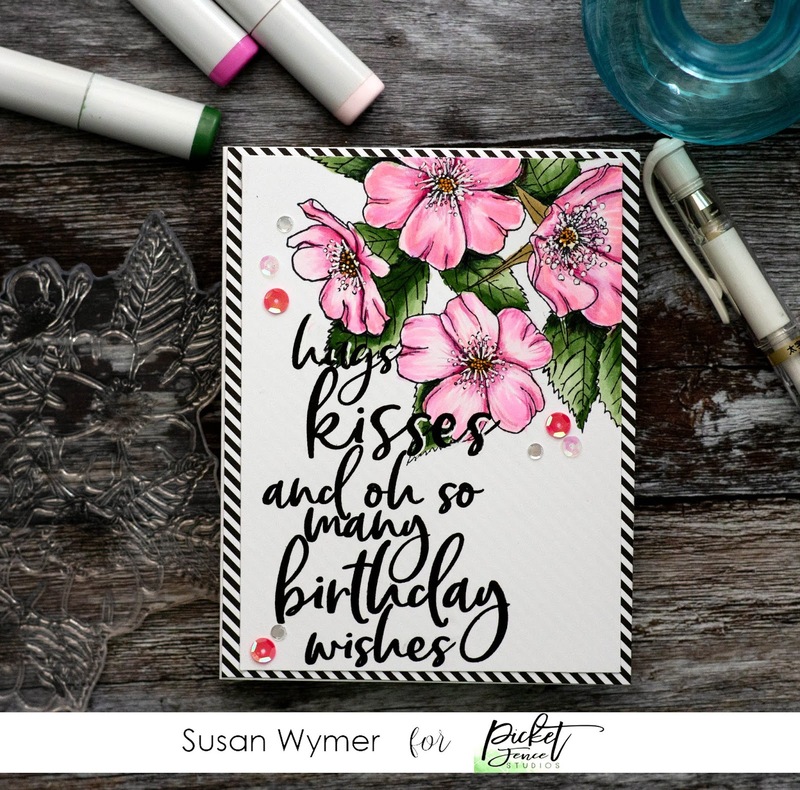 For today's card, I took some inspiration for the background from a card by Debby Hughes which I am privileged to say sits on my desk. For the background, I used Daniel Smith Moonglow, Rose of Ultramarine and Da Vinci's Payne's Grey watercolor paints to make a washy background. I splattered Sheer Shimmer Spray and watered down gauche to the background to give the look of stars. I die cut Moon and Back three times from Neenah Solar white 80 lb. card stock. I adhered them together for more dimension and then added it to the card using Golden Matte Medium. I did add a bit of twine for more sparkle. I added some extra stars to the background as well. I am shocked that there is no stamping on this card! Thank you for stopping by! Have a great Monday! Products Used: I am using compensated affiliate links at no further cost to you. I received the die from Impression Obsession as part of my design team work. 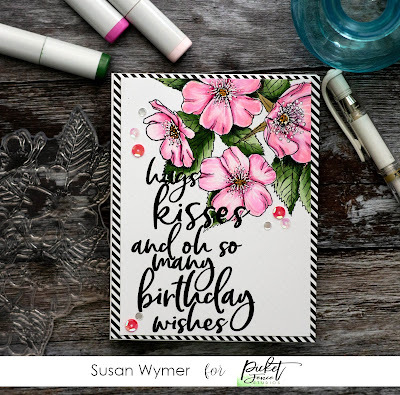 I work for Impression Obsession because I have used their stamps and dies for many years before I began working for them. I have four cards featuring new sets from the March Release. So many cute sets, dies and the sentiments are hilarious as always. The full release can be found HERE. I also have a $15 gift certificate to give away. Just leave a comment on my blog! Winners will be announced 3/21. Give away is open to all. Please note free shipping on any product ordered is for US customers only. First up, I had to use the new sentiment set - I Snorted - because yes I do lol!!! The girl in the picture is from Coffee Understands. I colored her with RV11, RV14, RV19 and added Crystal Stickles to glam her up. I colored her face with E0000, E000, E00, E01. I then splattered the panel with Sheer Shimmer Mist and added some pink sequins. Lipstick from Mac and nail polish from A-England lol! Next up, I had to make selfie frames for our unicorn from Let's Hang Out. She had been traveling around and this is a small scrapbook card. I did use an A7 card (5.5 x 6.5"). I colored her - yes her - with CO, C1, and C3. I added Glossy Accents to the frames and then die cut her using the accompanying die. 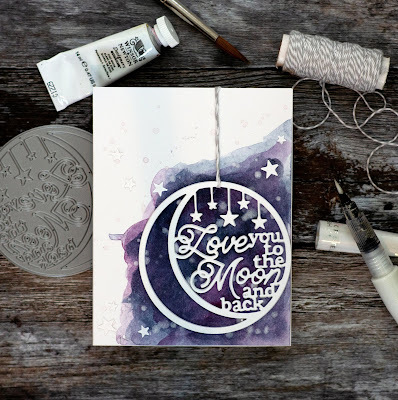 For the backgrounds I used heat embossing with Liquid Platinum Embossing Powder. I covered each background panel with vellum in order to dull the background down a bit. 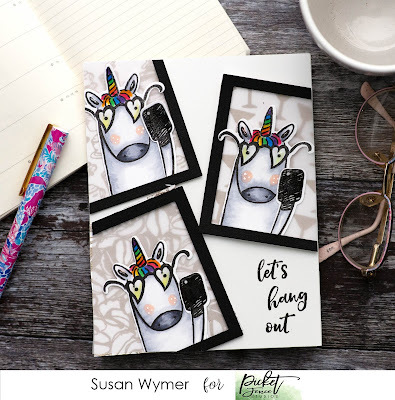 I wanted the unicorn to be the focal point. I did a little stamp surgery to make the greeting wonky - after all she had been out quite a bit! 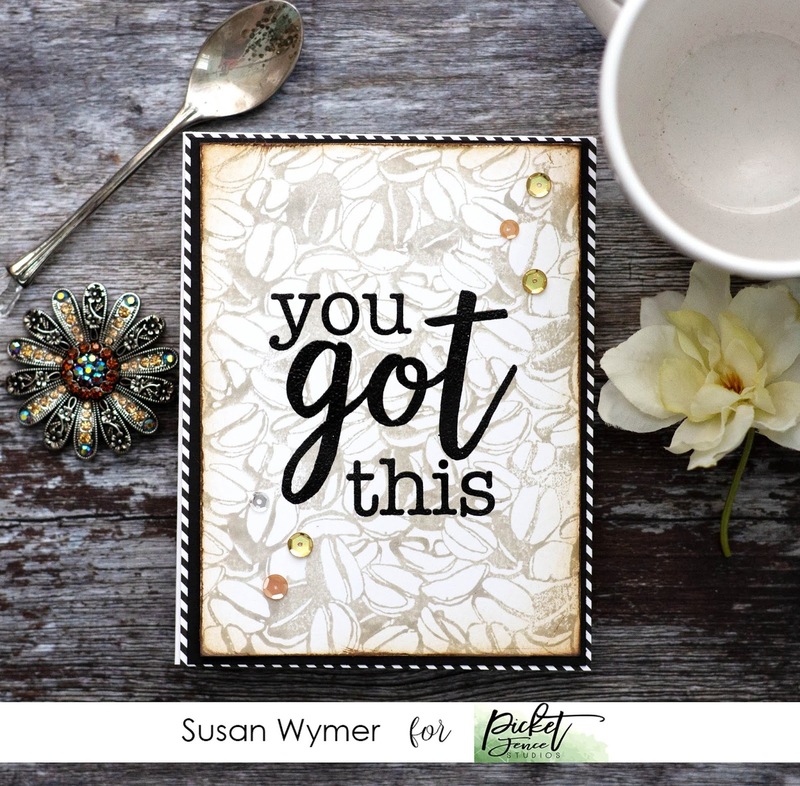 I really love this sentiment from You Got This. It is a perfect encouragement sentiment. I stamped Give Me a Break background with ooooh sorry I cannot remember but I did distress the edges with Antique Linen and Frayed Burlap Distress Oxide inks. I mounted this on a black panel and then on a black and white striped panel. A few gold sequins and I called this done! For my final card, I had to use Wild Rose Bouquet. It was calling my name loudly along with my Copics. Using my regular sized MISTI, I stamped it with Picket Fence Intense Black ink and then proceeded to color it. The flowers are RV0000, RV10, RV11, RV52. For the leaves, I used YG61, YG63 and YG67. I stamped the sentiment in Versafine Onyx black. A few touches with a white gel pen and a few sequins finished it off for me. My mother is questioning my judgement on using sequins lol! Products Used: I am using compensated affiliate links at no further cost to you. I make a small commission from each sale - thank you!!! I received the stamps and dies for these projects from Picket Fence Studios as part of my design team work.